14 Fun Facts About O Brother, Where Art Thou? 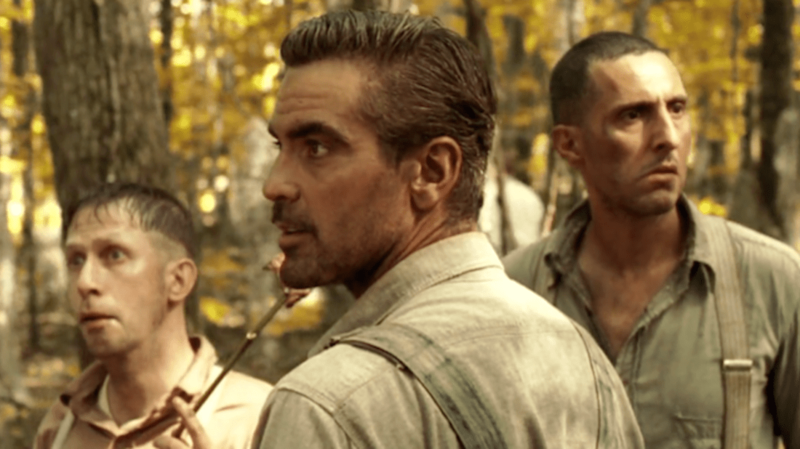 Set in Mississippi during the Great Depression and (purportedly) loosely based on Homer’s The Odyssey, Joel and Ethan Coen’s 2000 film O Brother, Where Art Thou? starred George Clooney as Ulysses Everett McGill, a criminal who tricks fellow convicts Pete Hogwallop (John Turturro) and Delmar O’Donnell (Tim Blake Nelson) into escaping prison with him in search of cash he had buried, when in fact he just wants to stop his wife from remarrying. Through their misadventures, the trio becomes famous as The Soggy Bottom Boys, a new music sensation. 1. IT WAS ORIGINALLY INSPIRED BY THE WIZARD OF OZ. 2. THE COEN BROTHERS NEVER ACTUALLY READ THE ODYSSEY. Tim Blake Nelson read it twice while attending Brown University. Before they asked him to play Delmar, the Coens sent Nelson the script and asked him for advice. The two used the comic book version of Homer’s epic when writing their script. 3. THE TITLE IS FROM A PRESTON STURGES CLASSIC. Sullivan’s Travels (1941) was a Hollywood satire about a comedy director who wanted to make a serious, epic drama, travels the country to research it, and discovers the world is better off laughing. The movie the character wanted to make was titled O Brother, Where Art Thou?. 4. CLOONEY SIGNED ON BEFORE READING THE SCRIPT. 5. CLOONEY RELIED ON HIS UNCLE JACK FOR HIS ACCENT. Jack, a Baptist tobacco farmer from a small town in Kentucky, was asked by his nephew to record himself saying Ulysses’s lines. After two months of shooting, the Coens asked why Clooney was saying every line perfectly, but omitting all the “hell”s and “damn”s from the screenplay; Uncle Jack refused to say those words. Jack had never been on a plane before flying in for the premiere. 6. TIM BLAKE NELSON BURNED THE CANDLE AT BOTH ENDS. Throughout the entire shoot, Nelson acted during the day and edited O (2001), the Othello update starring Mekhi Phifer and Julia Stiles he had directed, at night. 7. J.K. SIMMONS AUDITIONED, AND TURNED DOWN A PART. J.K. Simmons auditioned for multiple parts, but backed out when the one character the Coens were leaning toward casting him as was too similar to Vernon Schillinger, his racist character from the HBO show Oz. 8. THE MUSIC BECAME AN UNEXPECTEDLY HUGE HIT. For the movie's music—and even before they'd finished the script—the Coens turned to musician/producer T Bone Burnett, whom they had worked with on The Big Lebowski in 1998. Along with singer-songwriter Gillian Welch, Burnett found the songs for the movie. Its soundtrack—which combined original and traditional bluegrass, country, gospel, blues, and folk music—was the first movie soundtrack to win the Grammy for Album of the Year since 1994. More than eight million copies of the album were sold. 9. NELSON AND CHRIS THOMAS KING WERE THE ONLY ACTORS WHO DID THEIR OWN SINGING. Nelson performed his solo, “In the Jailhouse Now,” live for the movie. Chris Thomas King (who played Tommy Johnson) is an actual musician and used his own voice. Dan Tyminski, Harley Allen, and Pat Enright sang for The Soggy Bottom Boys in “I Am a Man of Constant Sorrow.” Tyminski provided Clooney’s singing voice. 10. NO, TOMMY JOHNSON WASN’T BASED ON ROBERT JOHNSON. The legend of blues legend Robert Johnson selling his soul to the devil to become a great guitarist is better known than Tommy Johnson’s tale. Rev. Ladell Johnson, Tommy’s brother, believed he had sold his soul to the devil for the same reason. 11. THERE WAS A SNAKE-CATCHER ON SET. "We hired this guy and he came to set with a golf club and what he would do is he would look around for snakes," Joel explained. "If he saw one he would rope it with the golf club and put it in this bag. I asked him what you called somebody with this profession, and he said, 'An idiot.'" 12. IT WAS ENTIRELY COLOR-TIMED ON A COMPUTER. 13. THE AMERICAN HUMANE SOCIETY COULDN’T BELIEVE THE COW WAS NOT REAL. A representative watched the scene where the cow gets hit by a car 10 times, even after being told the cow was digitally created. Eventually, the organization was convinced. 14. JOHN TURTURRO KNEW IT WOULD BE A HIT.